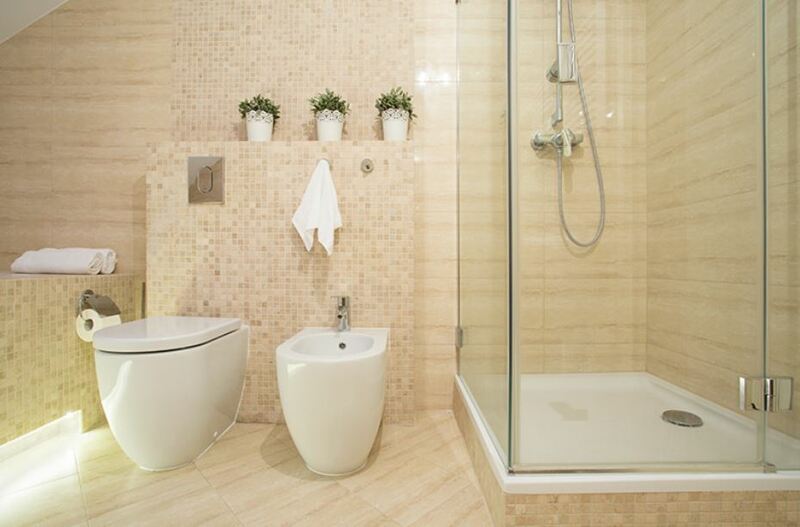 A good way to increase the value of your home is by remodeling the bathroom, especially if you have a small one. It doesn’t really matter whether you want to sell the property, for home staging or simply because you want to add some serious improvements to the functionality and look of the bathroom, a remodeling project is definitely going to make the environment feel more comfortable. It also adds a certain freshness to the whole home. 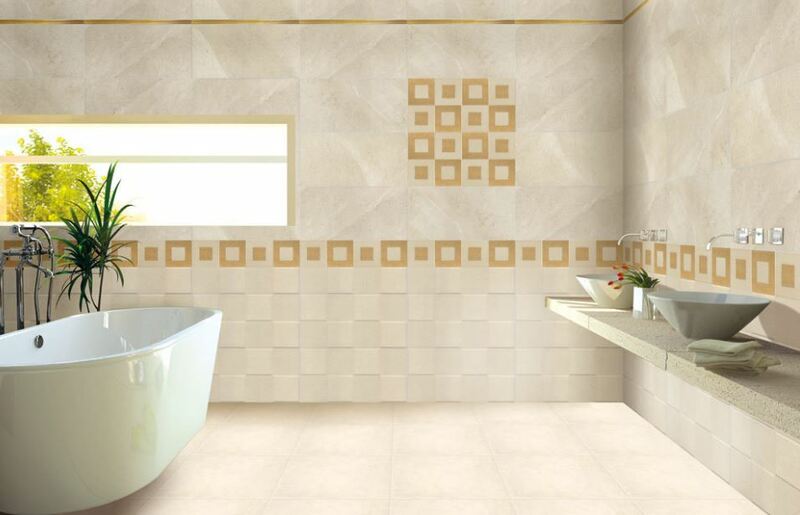 Bathrooms are essential rooms in any house and they have to be maintained properly in terms of practicality. It’s also important to work on the decorations and the overall design to give it a more elegant style. Remodeling a bathroom may seem challenging at first because you have to somehow balance functional aspects with the right decorations. Every design element that you fit in should, ideally, have some purpose and be functional enough to create a space-saving sanctuary. 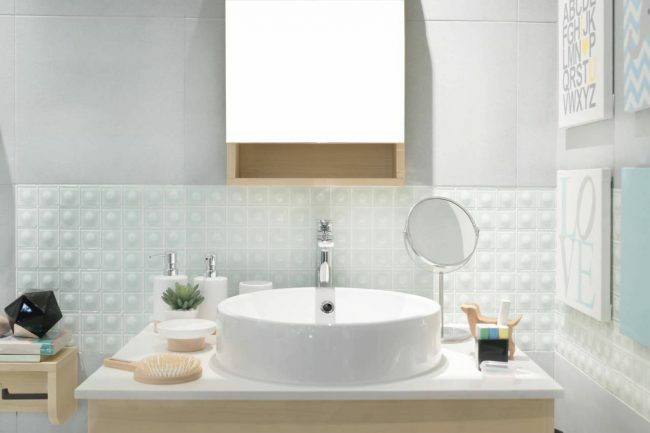 There are many remodeling trends that are hot right now but if you aren’t exactly sure which would be great for your bathroom, maybe this selection of ideas could help you out. There’s a smarter way for dealing with the problem of bathroom remodeling and these ideas have been specially chosen because of their nice balance of looks and functionality. Planning your color palette when you’re remodeling is important because you have to get the right color to match the feeling that you wish to convey to anyone using it. Neutral colors are usually great at making the bathroom transmit a calm feeling and it’s also very aesthetically pleasing to the eyes. Forming the base theme of the bathroom from a neutral color palette is generally recommended and you can make use of certain textures and patterns to bring more creativity and depth to the table. One simple fact worth remembering is that white is associated with cleanliness. Regarding the palette, it’s also worth trying to add some pops of color to create a more cozy ambiance and give the bathroom its own flair. This is done by showcasing colorful rugs, bathroom tiles, and hand towels among others. Vibrant towels and robes add some personality and a splash of energizing color. For a designer touch, put some stylish soap dishes and accessories up for display. For example even a simple trash can like this one can look great if placed smartly. I’ve mentioned the idea of showcasing colorful and textured towels and there’s another point that’s related to that. Open shelving is recommended for this compared to simply placing them in large cabinets where they can’t express their vibrant potential. 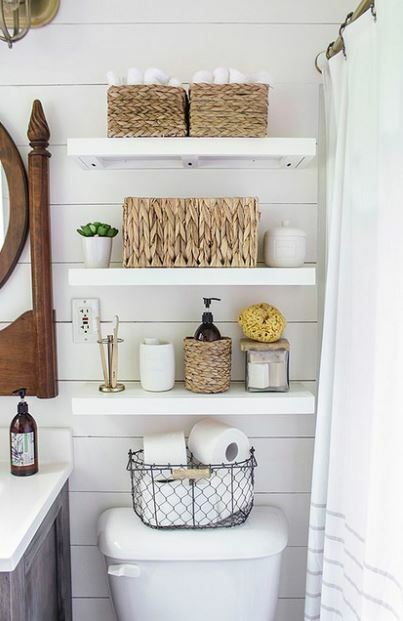 Storing items in your bathroom is important but you need to do it smartly and in a fashionable way because doing it wrong can negatively impact your bathroom’s look. By placing stylish towels in open shelving, you will bring some much-needed warmth to any bathroom space and the removal of large furniture pieces could be a good start if you want to open up your bathroom more. A bathroom that feels too cluttered is always giving off an unpleasant feeling and can be really uncomfortable, especially a small one. To expand your storage in a more clever manner, you could try using floating shelves and storage ladders that are very practical to keep containers. If you get your hands on some colorful models, you can really match well the rest of the bathroom’s decor and create a distinct personality. Hiding cleaning products with a sink skirt will also contribute to a cleaner bathroom look. When you’re remodeling a bathroom you should always pay attention to the design elements that you’re adding. Although keeping a nice look is important, you don’t have to go overboard. Instead of displaying lots of personal products on the bathroom counter, a better solution would be storing them using stackable baskets above dryer units or underneath cabinets. Minimizing and decluttering can have a profound effect on the design and the feeling of the bathroom. When you look more carefully through your stuff, sort it all out and prevent the displaying of knick-knacks or various items that don’t serve a purpose, you obtain a much more functional look. Bringing electronics into the bathroom seems to be a trend that’s been growing in popularity in recent times. From wireless speakers and various Bluetooth devices to TVs or even docking stations, you can fit lots of interesting devices into a bathroom which can be very practical. Many manufacturers have come out with bathroom elements like showerheads or mirrors that offer integrated devices. These products can add a new layer of fun and functionality to any bathroom. 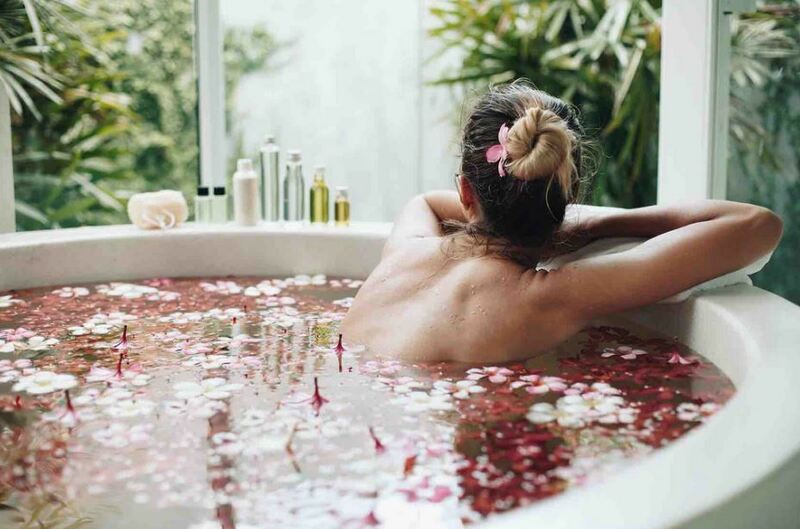 You can soak in a warm bath and relax even better as you’re watching your favorite TV show or movie. When you’re getting ready in the morning, watching the latest news and weather would be quite enjoyable. Some bathrooms can have problems with accommodating certain big electronics like a TV, but if you have space, it’s worth considering the idea. Besides being entertaining, electronics can also boost your multitasking and bring a new experience into a very familiar and personal place in your home. Everyone loves warm towels and having warm toes so you’ll definitely love this idea. It consists in adding some extra warmth by using in-floor heat and towel warmers. Radiant floor heat not only transfers soothing warmth from the bottom up creating a very comfortable experience but is also very energy efficient as the heat touches your body directly. On a cold winter’s morning, you’ll be really grateful that you decided to install this heat system. When it comes to radiant flooring, there are actually two types, electric and hydronic. While easier to install and less expensive initially, electric mats can get more costly in the long run than hydronic systems. Hydronic radiant flooring is water-based and so it needs a heat pump to get water through the pipes. No matter your choice, you need to be aware that radiant floor heat requires natural stone and tile for you to get the maximum thermal benefits. If in-floor heat is too expensive for you, maybe opting for a towel warmer can deliver at least some good warmth to your towels. They have more affordable prices. Showers seem to be more popular than tubs these days and a simple explanation for that could be that they are simply more practical. If you want to make a big change in your bathroom, you can try to upgrade the shower to one with more premium features like high-tech body sprays or spa-like water jets and showerheads. 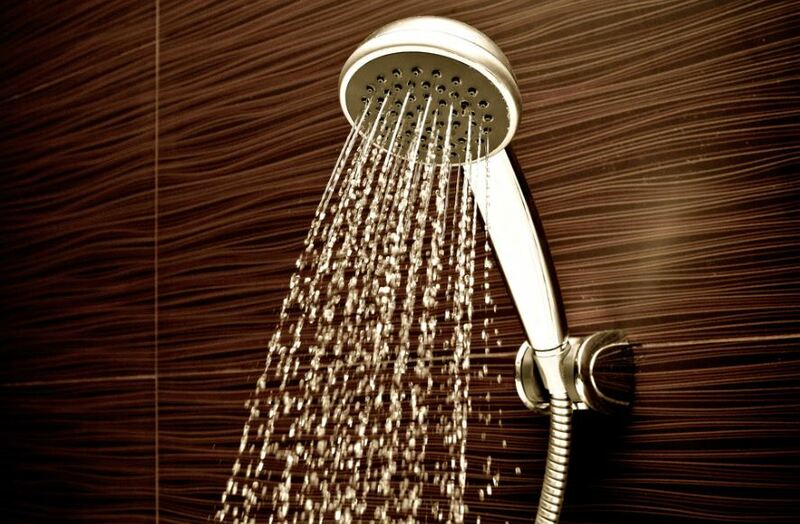 Some of the most interesting options are fully enclosed steam showers which provide multiple showerheads. Although these were once a luxury, they are now turning into a conventional choice for lots of remodeled bathrooms and new homes. Another great feature to add to your shower is a built-in or a portable bench that offers a nice place to sit and contemplate. This is a relatively inexpensive method to create a more relaxing place in your shower if you have enough space. Adding an element of surprise can always prove smart in the long run. While you might get used to having LED lights that turn on during night time, your guests will surely love them. We also advocate that beauty can come along with usefulness all the time. 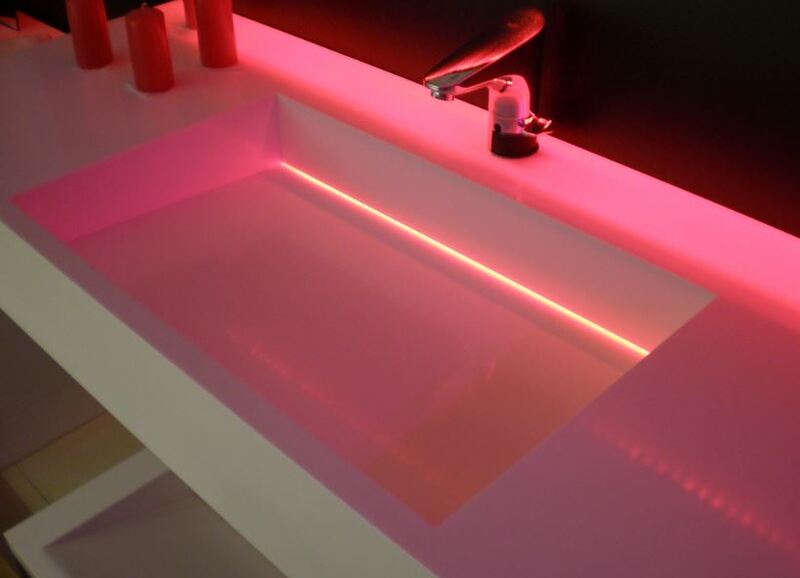 So adding an element like a dim LED light near your bath sink or mirror can be quite useful if you don’t want to turn on the lights right after you got out of bed. Your sleepy eyes will surely thank you. That wraps it up with our 7 smart remodeling ideas. We wanted to give you some quick tips that we thought could be a starting point for your upcoming remodeling projects. Thanks again for reading and hope to see you on our next guides.